Pete Finney of the Times Picayune is a walking treasure trove of most anything sports and New Orleans, he having written for the paper since – World War II. As an opening eulogist for David Dixon at Holy Name of Jesus Church on St. Charles, he spoke just like he writes: candidly and amenably. Pro football and New Orleans were eventually going to catch up with one another, regardless of whom and whatever was in between them. The game was oozing with growth in the 1960’s, paralleling that of television as a household appliance instead of an entertainment luxury item. Baseball devotees were first squarely affronted with America’s Favorite Pastime in the past tense, as to what really was America’s Game. Some are still in a little denial about that today, even though it doesn’t matter. But it was Dave Dixon who arrived at the bonfire first, armed with a match. His most strident work may have been in not knocking anything off the tables while maneuvering between them, when orchestrating exhibition football in a Deep South segregationist city. Concurrently, he had to convince the board that the field behind the ivory walls of Tulane University was suitable for playing commercial enterprise, because it was in the best civic interests to do so. Of course it was. And yes, that copper colored oval downtown was very much his baby. It ignited commercial real estate development on that end of the Poydras corridor, for which receiving bursars at the Orleans Parish Tax Assessor’s Office should be eternally grateful. Dixon’s only regret about the building was that some lives were lost in it, in the fall of 2005. With promoters in general, it can seemingly turn into always something. Dixon’s subsequent foray with spring football was cut short by his business acumen that foresaw it running itself into the ground, which it did several times over, he having cashed out before it ever kicked off. There was a volley with World Championship Tennis, partnering with Kansas City Chiefs owner Lamar Hunt. He had another pigskin idea, that of a bi-partisan, democratic league, where the fans owned and operated it on their city’s behalf, avoiding the cyclical clashes that can occur with owners that have restless personalities and titan images of themselves, at the same time allowing fans to look nowhere else but in the mirror if their team pulled up the rear end of things. What he was really espousing was an advanced community ownership model of the Green Bay Packers. Perhaps he only dreamed that remotes on waistbands could replace transmitters in quarterbacks’ helmets, and fans could call the plays with Skype. Yet regardless of what he proposed, Mr. Dixon always did it from the heart, particularly if it was about New Orleans, as Mr. Finney often saw, first hand. From the excerpts, Dixon’s book is informative and entertaining, yet another one added onto my list, The Saints, The Superdome, And The Scandal (2008, Pelican Publishing Co.). In my A Tale Of Two Seasons, Katrina & A Super Bowl, Dixon is naturally co-prominent in the chapter Godfather Of The Saints, though the title is not named for him. Though his son Stuart was a year ahead of me at Metairie Park Country Day, at some point in my mid to late twenties, I showed up unannounced at Mr. Dixon’s art gallery in the Quarter and introduced myself. Feeling I had gotten some legs back under me after a season playing club ball for the Kenner Cardinals (semi-pro is a euphemism; nobody gets paid and guys change into uniforms out of the trunks of their cars), and with a loose grip on reality, I asked him if he would consider making a call for me to get a tryout with the Saints. He said, “Well, I’d be glad to make a call over there, see what I can do, but with no credible college experience to back it up with…..” The call rightly stayed in house, but the only point of this little confessional is that, up close and personal, Dixon was receptive, kind, and wanting to help. So ‘Dat’s how he will be remembered here (coincidentally, he passed away at age 87, my schoolboy jersey number). There were some public faces at the service, but the ceremony was definitely not about them. Television cameras were outside, where they belonged. Poetic justice was not just a concept in Dixon’s life, he having lived long enough to see the Saints finally win a title. After the half-open casket was closed, his coffin was draped with an American flag, though it may just have well been Black & Gold, the color of a little umbrella a lithe dancer slowly waved above her head, in leading a Second Line for the final procession. The Zion Harmonizers choired in with an alert and uplifting version of Oh When The Saints as has ever been heard. The old adage about it being unlucky to open an umbrella inside, and in the sanctity of a church, did not seem to apply, and was no sin whatsoever. 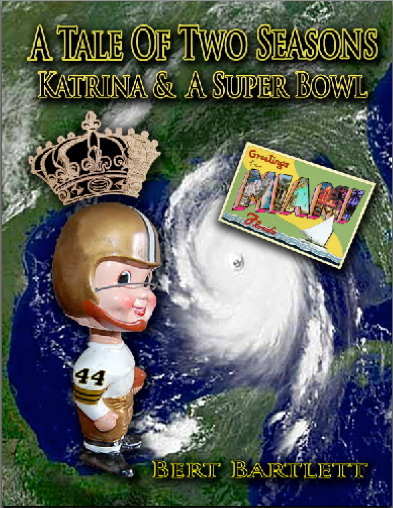 Posted in Uncategorized.Tagged A Tale Of Two Seasons, Dave Dixon, David Dixon, Green Bay Packers, Holy Name Of Jesus Church, Hurricane Katrina, Kansas City Chiefs, Louisiana Superdome, Metairie Park Country Day, New Orleans, New Orleans Saints, NFL, Orleans Parish, Pete Finney, Poydras St., Pro Football, The Saints, The Superdome And The Scandal, Times Picayune, World Championship Tennis, Zion Harmonizers. I LOVED this piece about Dave Dixon. You really nailed it in your tribute to him. Pleasurable to PERUSE!!!! Dats U!!! When is SJ gonna be US again ? I enjoyed watching #87 run patterns for the MPCDS teams of 73 and 74. I appreciated the introduction to his writing vis-a-vis my Googling for Dave Dixon pieces. Great to hear from you, and thanks for the kind words. Where is the Salisbury School? Hope all is well. David Bland’s son Jeb, #70, plays offensive LT for the Cajuns, who made state regionals last fall. He will be a senior this year and made good strides as a player. I’ll pass on to him I heard from you.